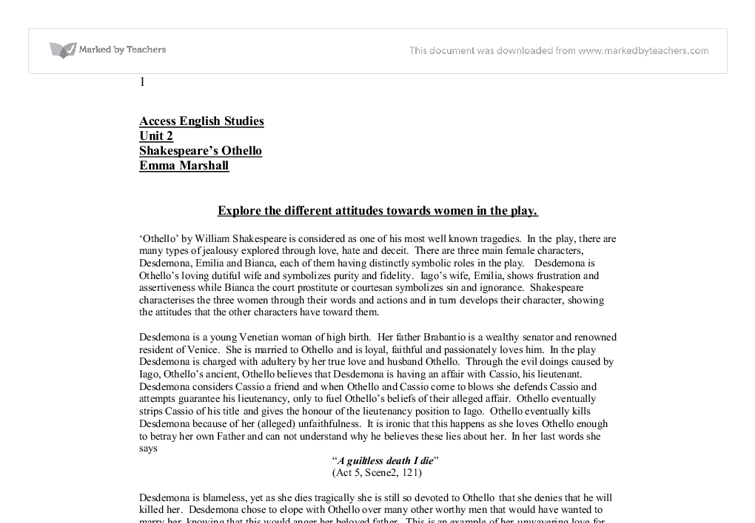 Access English Studies Unit 2 Shakespeare's Othello Emma Marshall Explore the different attitudes towards women in the play. 'Othello' by William Shakespeare is considered as one of his most well known tragedies. In the play, there are many types of jealousy explored through love, hate and deceit. There are three main female characters, Desdemona, Emilia and Bianca, each of them having distinctly symbolic roles in the play. Desdemona is Othello's loving dutiful wife and symbolizes purity and fidelity. Iago's wife, Emilia, shows frustration and assertiveness while Bianca the court prostitute or courtesan symbolizes sin and ignorance. 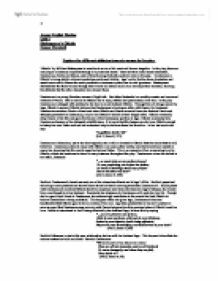 Shakespeare characterises the three women through their words and actions and in turn develops their character, showing the attitudes that the other characters have toward them. Desdemona is a young Venetian woman of high birth. Her father Brabantio is a wealthy senator and renowned resident of Venice. She is married to Othello and is loyal, faithful and passionately loves him. In the play Desdemona is charged with adultery by her true love and husband Othello. Through the evil doings caused by Iago, Othello's ancient, Othello believes that Desdemona is having an affair with Cassio, his lieutenant. Desdemona considers Cassio a friend and when Othello and Cassio come to blows she defends Cassio and attempts guarantee his lieutenancy, only to fuel Othello's beliefs of their alleged affair. ...read more. in your parlours, wild-cats in your kitchens, Saints in your injuries, devils being offended, Players in your housewifery, and housewives in your beds" (Act 2, Scene 1,108) Emilia's bitterness is due to this poor relationship she has with her husband Iago. This frequent abuse that she endures makes her bold and direct. She tells Desdemona "Tis not a year or two shows us a man: They are all but stomachs, and we all but food; To eat us hungerly, and when they are full, They belch us." (Act 3, Scene 4, 98) Emilia is a woman from a common life opposed to that of Desdemona, She feels unappreciated and is a frustrated hard working housewife. Bianca is a prostitute who Cassio visits frequently. When Cassio finds Desdemona's handkerchief, he gives it to Bianca to duplicate the stitching. Bianca becomes upset and assumes it is a gift from another woman or lover, though being a prostitute she probably has other lovers herself. She is the only female in the play that Cassio shows less respect to and is too ignorant to see that she is merely Cassio's courtesan rather than his lover or girlfriend, which see sees herself to be. Bianca is eventually accused of stabbing Cassio when it was actually Iago in an effort to kill him as ordered to by Othello. ...read more. Very nature will instruct her in it, and compel her to some second choice" (Act 2, Scene 1, 212) Each of these three women end up being wronged by the ones they love or because of the ones they love. Desdemona is killed in her wedding sheets, by the man she ultimately gives her life for, Othello. She remains faithful and pure even after her death. Emilia is also killed by her husband Iago. Like Desdemona, she is killed because of her unfaithfulness to her husband, but in this case the deceit being true. She defies her husband by telling everyone the truth about his involvement in the death of Desdemona. Emilia remains strong, standing up to Iago knowing that her death would be the consequence. Bianca's sinful and ignorant nature leads others to believe that she is the one to blame for stabbing Cassio, the one she loves and is arrested for doing so. Although in this play all three women have very strong characters and play vital roles, the attitude shown are very much that women are untrustworthy and all the same in the end. That the social classification between Desdemona and Bianca maybe on opposite spectrums they are both women and in end, whores that can not be trusted, though the evidence shows different. ...read more. According to official statistics, self reported data/victimization data males commit most crime (K.Brewer (2000) P.25). 80% of offenders are male (Home Office, 1999). However, figures must be looked at with care, as the above aren't always reliable/valid methods of collecting data.